Full Size (available in all sizes). I was wondering how much the Backwoods headboard is for a queen size bed. Also wondering if it is best to buy the headboard first or the frame for the bed first. I am concerned about the head board fitting the bed since they aren’t being bought together. Thank in advance. 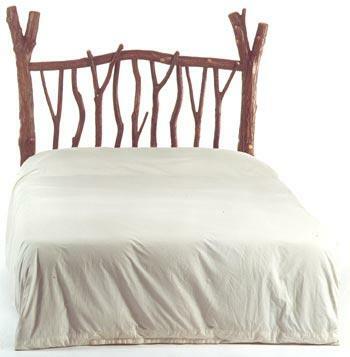 The backwoods headboard in queen size is $575, plus shipping and sales tax, if applicable. It is best to have the frame first, and then give us the measurements from floor to bolt holes, and horizontal distance between bolt holes. That way we can make the holes to align with the frame. Many times people just attach the headboard to the wall. This way the bed can be pulled out for cleaning without dragging the headboard along. Let me know if you have more questions. Thank you! Thank you so much for the info. We live in Hamilton, so we would probably just come and pick it up. We aren’t quite ready for it yet, but hope to be in a few months. Thank you so much for the info. We will be in touch. Is this something you keep in stock or does it need to be ordered? Can you tell me your hours on Saturdays. We would like to visit. Carol, We are open 10-5 Monday through Saturday, and by appointment. But if you want to verify before you come, you can always call. Our number is 660-851-1154. Thank you! Okay, thank you. We will be up one of these Saturdays.